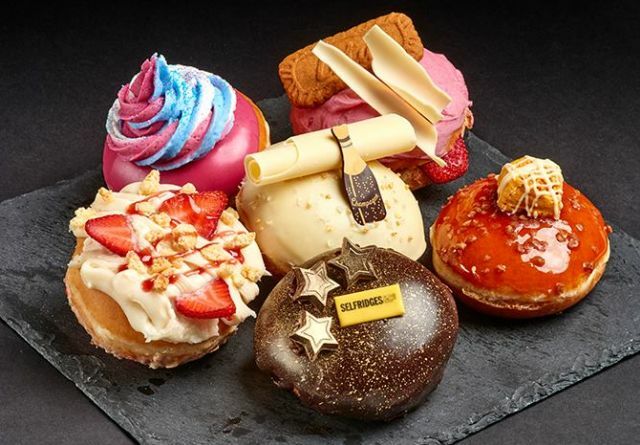 If you've ever wondered what extra-fancy, upscale donuts from Krispy Kreme might be like, you'll probably want to head over to London where one Krispy Kreme location serves up an exclusive line of donuts featuring ingredients like Marc de Champagne, Belgian white chocolate, and honeycomb toffee. The store is located inside of the food hall at Selfridges, a high-end department store similar to Neiman Marcus, Bloomingdales, and the like (and, interestingly enough, founded by an American in the early 1900s). - Red Berry Drizzle donut - A yeast shell donut with a paillete feulletine (lacy crepe crumbs) base and raspberry filling. It's topped with cream cheese frosting, biscuit pieces, fresh strawberries, and a drizzle of red berry coulis. - Popping Champagne donut - A yeast shell donut with a Marc de Champagne (a brandy made from a by-product of Champagne) infused Belgian white chocolate Kreme filling. Topped with a dollop of champagne Kreme, Belgian white chocolate shavings, and a little "razzle dazzle" (popping candy and gold sugar). - The Magic Unicorn donut (Yep, Krispy Kreme joins the unicorn trend) - A yeast shell doughnut filled with multi-colored Kreme, dipped in purple icing, and topped with swirls of purple, white, and blue Kreme and glitter dust. - Strawberry Biscuit Bite donut - A yeast donut layered with freshly-cut strawberries and Biscoff caramelized biscuit Kreme and topped off with strawberry frosting, Belgian white chocolate shavings, and a Biscoff biscuit. - The Selfridges donut - A yeast shell donut filled with chocolate frosting and covered dark chocolate ganache speckled with golden dust. 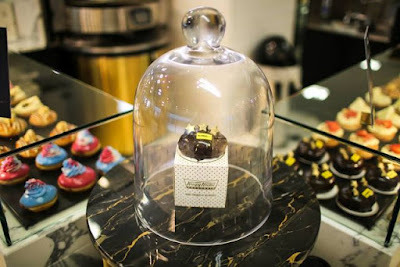 It comes decorated with golden Belgian chocolate stars, and a candy Selfridges plaque. - Salted Caramel & Honeycomb donut - A yeast shell donut with a salted caramel filling, finished with caramel glaze, salted caramel shards, and a piece of honeycomb toffee drizzled with white chocolate. Apparently, the location is also the only Krispy Kreme in London to offer the chain's signature hot Original Glazed donuts. Photos via Krispy Kreme UK.